Imagine the sights and smells: herds and huddles of leaves and white snaking roots, crowded, cozy, thickset clumps and dense tapestries of green; fecund carpets of moss; islands and hills of bark in continents of brown - tawny, coffee, cocoa, rust; blankets of spongy peat, rafts of it; curtains of cool white mist; waves of a waxy perfume that insinuate around posts and on unseen currents of air - pregnant and powerful; pools and ripples of sunlight filtered through tall wood, and trees; acidgreen moss, pervasive, persistent, layers upon layers of life. 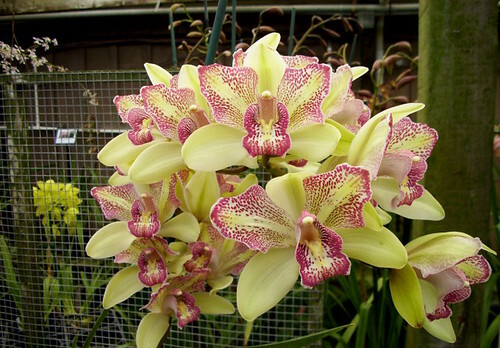 This is the playground of orchids, the cathedral, the Carnival, the dream and the reality of them. Since the beginning of the 20th century, Santa Barbarans have found great success with orchids, sometimes with little effort. 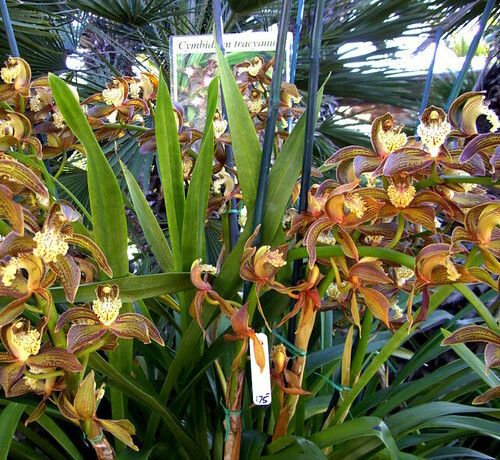 Thousands of homes in Santa Barbara have big colonies of cymbidiums that thrive to perfection, out in the open, shaded only by a patio roof, tucked in a niche here or there, or, as Dr. Franchesci suggested, grown in a simple terra cotta pot, in the mottled shade beneath a favorite tree. 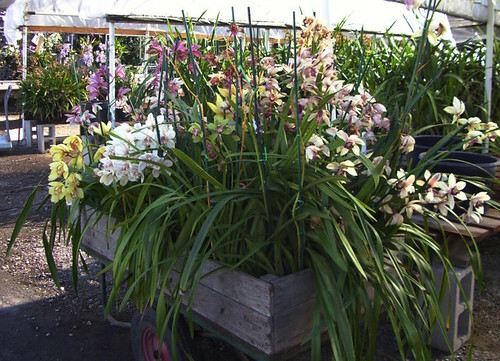 The growers at the Santa Barbara Orchid Estate have improved upon that simple recipe. 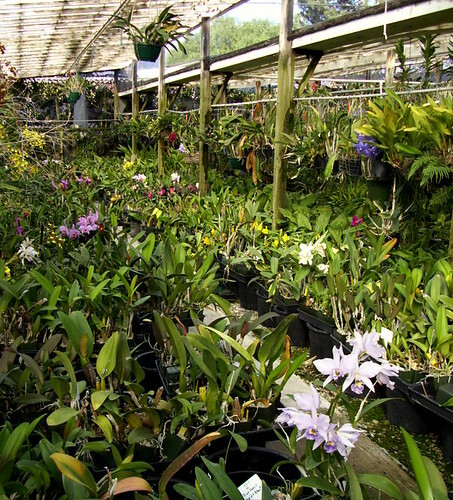 They grow wide varieties of orchids, year round, and show and sell them around the world. But any day of the week, between 10am - 4pm, you may visit their greenhouses, and wander the soft, damp pathways with abandon. 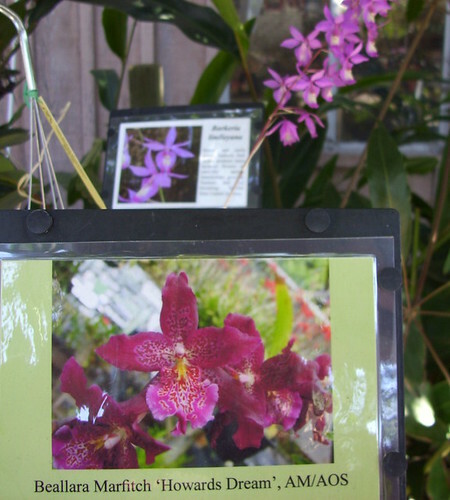 You may submerse yourself in orchid culture, orchid choirs, orchid frenzy - orchids gone wild. 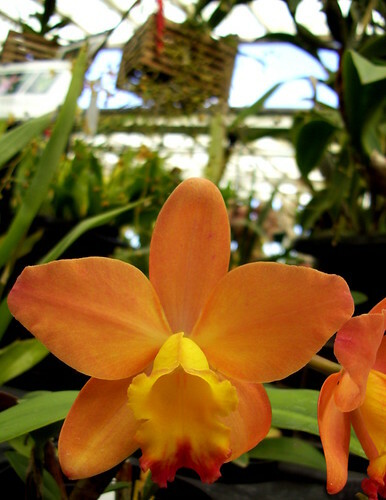 Even now, in November, when much of the northern hemisphere is blanketed in snow, orchids bloom and abound at the Santa Barbara Orchid Estate. To find the greenhouses, take Highway 101 to the Patterson Road exit. 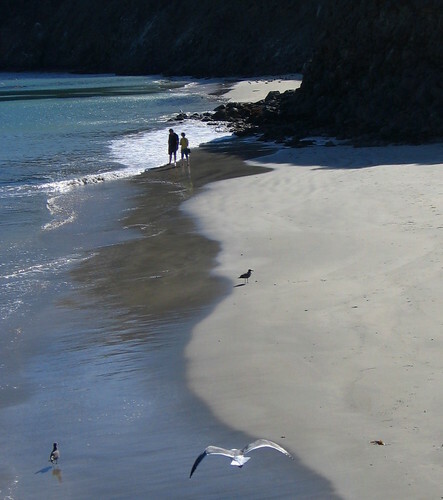 Turn toward the ocean, and drive. Drive past the hospital and doctor offices, past the dark tilled fields. Drive past signs that warn, "Dead End", "No Outlet", and "Road Ends". Keep going. You are sure to see kids on bicycles, or riding their horses, people walking dogs, or just hiking. The landscape is quite sylvan now. When you find the abrupt curve in the road, and drive up a little rise - you know you are almost there. 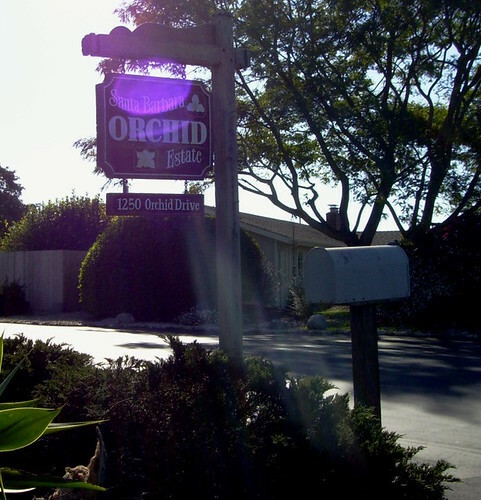 Soon, on the left, you will see the small, humble sign for the Santa Barbara Orchid Estate. Take the long gravel drive toward the greenhouses. 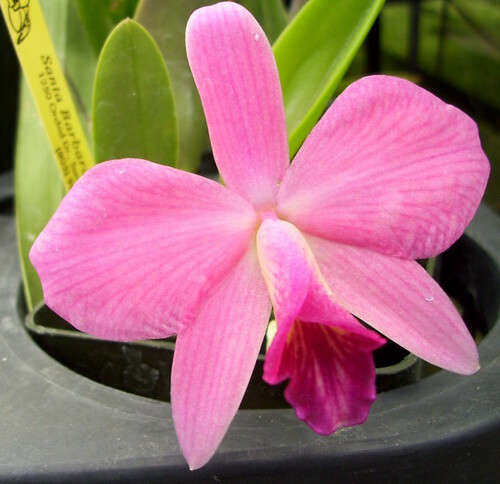 You'll immediately find blooming orchids, some as big as your hand, some as tiny as a pencil eraser, and everything in between. They are everywhere outside the estate: in wagons, on fences and trees, in rows of lath houses, perched on tables and shelves. And you haven't even entered the greenhouse yet. 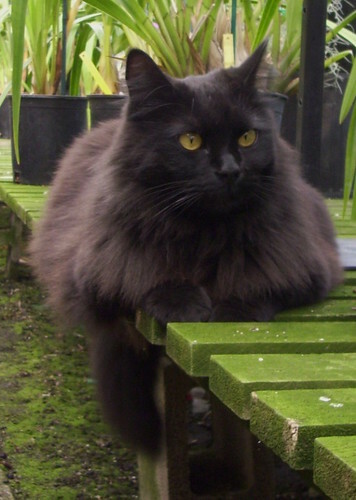 More than likely, Pepper, the Estate cat, will come out to greet you. 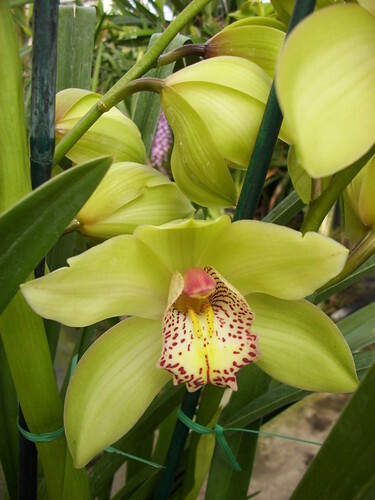 One of the employees will also come out, ask if you need any help, if you seek a particular orchid. If you say no, you are just looking, they will let you roam for hours, uninterrupted. ....to no avail. I become intoxicated...I am literally tipsy as I wander the aisles, and gaze into faces that broadcast the breath of the divine. 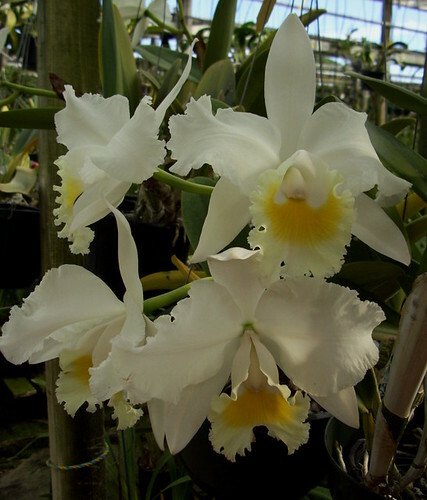 I return, again and again, to inhale the heavy perfume of the white orchids, the albas; the fragrance is so thick it is almost a liquid on the air. I glance at the pictures, but I am lost - I fall with my whole heart into the beauty of the real flower that blooms before me. 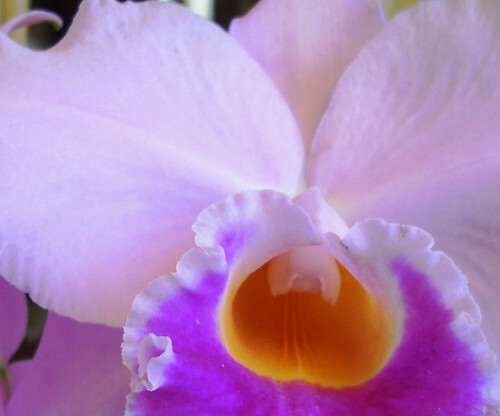 So I make up names: Frosty Lime, Orchid Parfait, Hypnoorchid, Lemony Fizz, Orange Crushin', Orchid Wow. It's easy. And I never remember the names I give them, either. Perhaps you can exhibit more restraint than I, remain unruffled and concentrate on the information printed on the cards before you - perhaps you can be a better student. 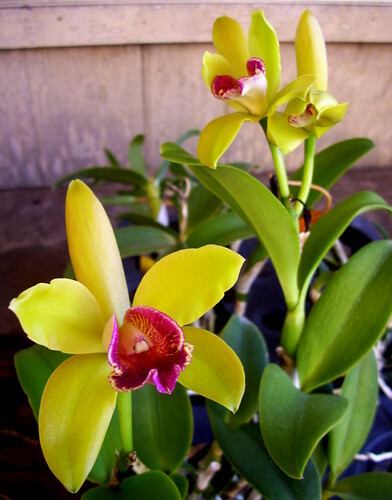 Next weekend, November 28 and 29, 2009, is the Annual Santa Barbara Orchid Society Fall Show. 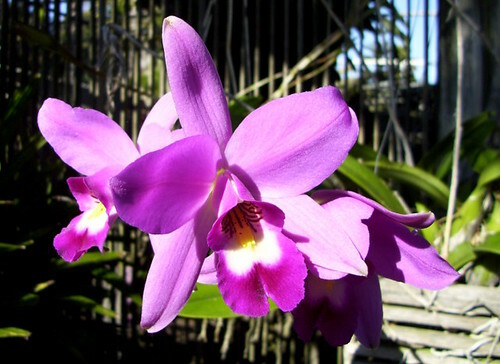 The title of the show is Orchids in Paradise. I can't think of a more fitting name. 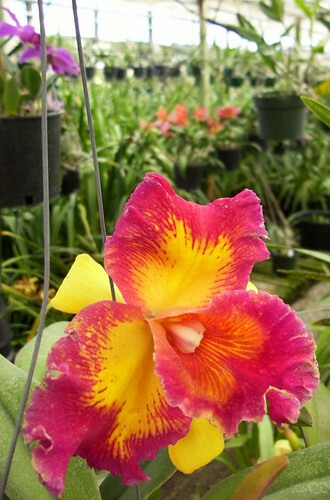 If you find yourself in Santa Barbara, visit the show, then take a few hours to visit the Santa Barbara Orchid Estate. It will be a weekend you won't soon forget. 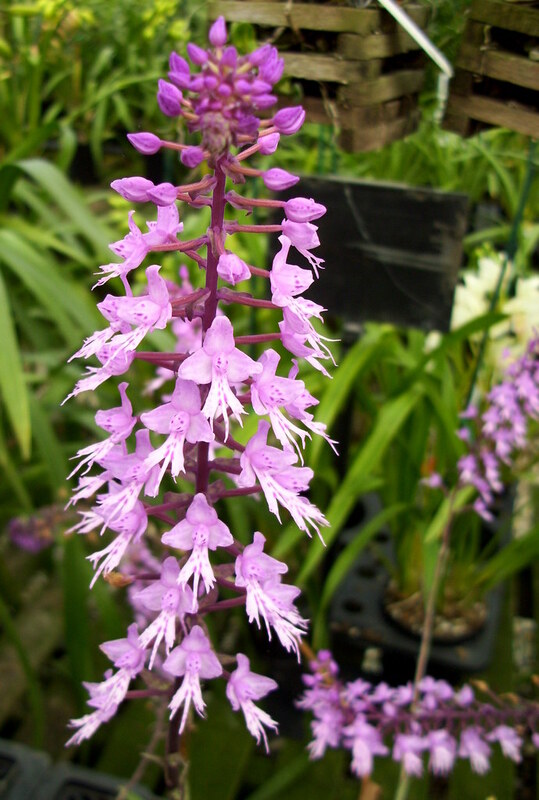 Unlike the names of the flowers. The strelitzia regina, when blooming in perfection, is a magnificent plant...a great beauty....A drop of pure nectar distils from each flower, and stands, like a gem, on the outside. The whole combining to form a unique and gorgeous spectacle, justly admired by every beholder. 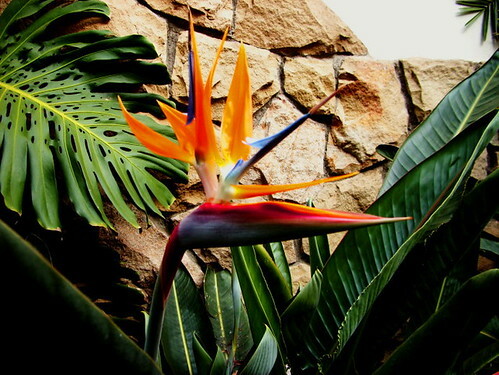 In the Language of Flowers, the Bird of Paradise, strelitzia reginae, symbolizes all these words. A native of South Africa, the Bird of Paradise is perfectly at home in Southern California, whose climate is so similar to its native land. The Bird of Paradise is the official flower of the City of Los Angeles. 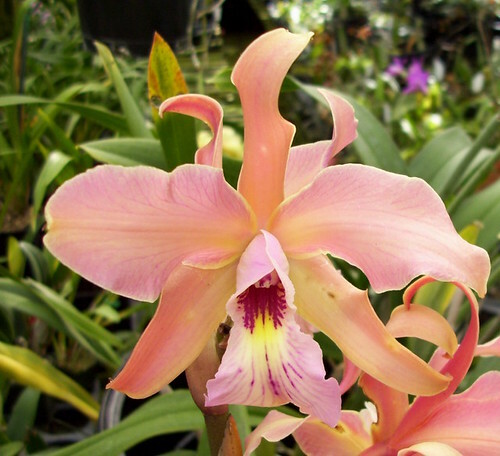 It is widely used throughout Southern California, and is beloved by those of us who adore its colorful florescence, the broad, tropical leaves, and its dramatic pose in a landscape, the regal tilt of its floral head. When strelitzia regina was first brought to the United States, it was grown in botanical gardens, conservatories, and even in the parlors of wealthy residents of the east coast. Today, it is easy to obtain the Bird of Paradise, and no matter where you live - you might want to try your hand at growing this very special plant - indoors or out.